This page will be under constant improvement as the dictionary will be expanding! Paranormal - experiences that are outside of the range of normal experience or scientific explanation (inconsistent with the world as already understood by empirical observation coupled with scientific methodology). Apparition - The appearance of a person, animal or object that should/could not be seen by normal senses. 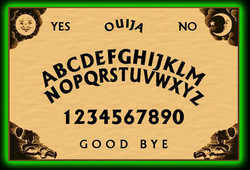 Contrary to popular belief a lot of apparitional sightings are of the living and not the dead. Apparition (of the dead) - More commonly know as ghosts. Spirit - a ghost that you maybe able to 'interact' with. Spirit - 'divine' essence, part of the triad of human existence (mind, body, 'spirit' sometimes used instead of soul, but not precisely the same). Sometimes used in folklore/religions of the world to include things such as fairies, elves, demons and angels. Ghost - the apparition of something that is dead, be it a person or animal. Sometimes the term ghost can be used for an apparition that does not 'interact' with those witnessing it, i.e. an anniversary ghost that appears every year on a specific date and seen to carry out the same action. Clairaudience - 'clear hearing' a form of extra-sensory perception (ESP), where a person aquires information via paranormal auditory means. Clairvoyance - 'clear vision/seeing' a non-sensory awareness of some object, person, location or event.